I’ve had several teachers over the years speak of the shoulder diaphragm without being clear about its structure. I have often been confused to whether they were referring to the thoracic inlet, the shoulder girdle, or both. I am still unclear, but over the years the question has allowed me the opportunity to unfold the complexity of this area of the body for myself. As we discussed in our explorations of the skeletal system, the only place where the upper extremity meets the torso is the sternoclavicular joint, where the breast bone and collar bones come together. You may have noticed that each of our diaphragms make either a diamond or circular/oval shape. And the shoulder girdle, forming a diamond, is no different. 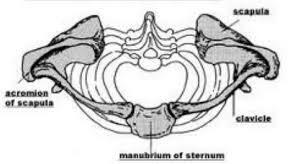 It’s front point is the manubrium of the breast bone, shared with the thoracic inlet. Then it travels the length of the collarbones to it’s lateral point, the acromium of the scapula. From there, we travel toward the back body to the shoulder blades. Interestingly, there is no bony point to form the back of this diamond. But through muscular attachments, you could consider the spinous processes of all of the thoracic vertebrae. This amorphous back point allow the shoulder blades and arms their vast range of mobility. But this mobility sometimes allows us to lose the integral support of the back body in favor of collapse of the chest and forwardly rounded shoulders. In the thoracic inlet post, we discussed lifting the manubrium from the root of the feet or the seat. This is also useful for finding a healthy postural position of the shoulder girdle. One of the biggest culprits for a forwardly rotated shoulder position is a tight pectoralis minor and it is very hard to get a release via stretching. There are poses that help open the front of the chest and they should definitely be practiced. But don’t forget that the other side of the equation is the strengthening of the back body, in particular the muscles that bring the shoulder blades toward each other. Those are the rhomboids and the middle and lower trapezius muscles. Belly down backbends are excellent for strengthening these muscles. Come to lying on your belly with the arms out to the sides and the thumbs turned up toward the ceiling from the upper arms. Begin by keeping the head down and lift the thumbs and arms straight up toward the ceiling squeezing the shoulder blades together. After a few rounds add the lift of the head. How many variations of belly down back bends can you think of? Practice them all! The shoulder blades also have a tendency to wing if the anterior serratus muscle is not strong. It runs from the medial border of the scapula to the lateral rib cage. Its job is to protract the shoulder blades, or knit them to the rib cage. When practicing table or plank, use serratus anterior to draw the shoulder blades flat against the rib cage. As we stack the shoulder diamond on top of the thoracic inlet, again find the lift of the manubrium from the rooting of the base. Begin to play with pointing the outer tips of your collar bones forward, back and then straight to the sides. This wakes up your range of choice. Try to find equal width across the front and back of your chest. Play with maintaining equal width in various poses. Be conscious about when you vary from it, why, and how it supports you. Play with it in different arm positions. How does it support you in weight bearing poses through the arms: down dog, handstands, crow, e.g.? Let us know what you find.